The sea voyage is long and Jane spends enough time unable to perform glamour that towards the end of the trip she discovers that she is with child. They are overjoyed, but when they finally arrive at the estate to complete what they expect to be routine legal tasks, they realize that nearly everything they came expecting to find had been a lie. Also, the entire estate is in disarray, with horrifying conditions and tensions with the local slave population so high that they are close to revolt.Jane and Vincent's sense of peril is screaming out for them to flee, but Vincent cannot stand to leave an estate connected with his family in such a condition. They have survived many grand and terrifying adventures in their time, but this one will test their skills and wits more than any they have ever encountered before, this time with a new life hanging in the balance. 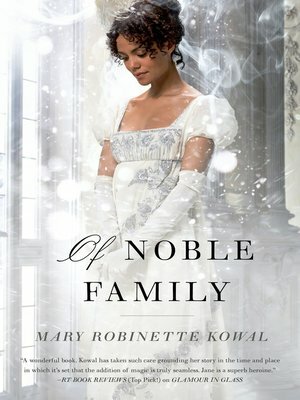 Mary Robinette Kowal's Of Noble Family is the final book of the acclaimed Glamourist Histories.